One of the most important elements in the building of any Destination Brand is the engagement of the people who actually live there. Seeking their advice and input, and ultimately helping them feel proud about where they live, is paramount. In the arrivals area at Stockholm-Arlanda Airport, the hall of fame presents some famous Stockholmers. Its very much about building local pride and involvement, as well as promoting Stockholm to its visitors. 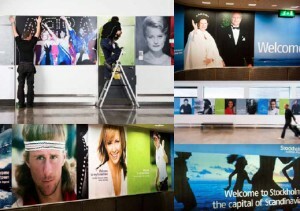 It gains great attention and utilises space in a valuable way to help build the Stockholm brand. Should Sweden make a bid for the winter Olympics? A Moment in History. December 10th 2011 & The Nobel Peace Prize. E is for exclamation mark!